I’m actually surprised it has taken this long for Square Enix to come up with its own spin on the Monster Hunter franchise. Capcom’s behemoth has certainly been successful in creating an entirely new genre, in which players take on hulking beasts in highly strategic, complex, sustained battles. 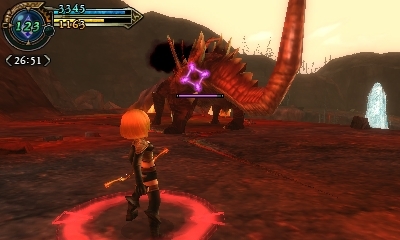 Titles such as Toukiden and Soul Sacrifice have done quite well at taking a similar approach as Monster Hunter, and the genre clearly sells well. So it’s surprising to see Square Enix take its time with Final Fantasy Explorers, but I’m glad it exists, because it does things quite differently. Related reading: Monster Hunter 4 is the most recent in the original series on the 3DS. Nick's full review here. 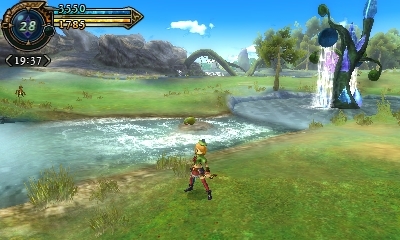 Where most Monster Hunter games are heavy action affairs, where players need to make use of precise button combinations and character movement in order to be effective on the battlefield, Final Fantasy Explorers takes some cues from its JRPG heritage, and instead offers more abstract, menu-heavy affair. Players start by choosing their class (taken from the classic Final Fantasy job system), which they can freely switch between as more classes become available, and then they set up a series of skills that they’ll take into battle. As they head into the wilderness they’ll then encounter a charming mix of popular Final Fantasy critters (and some of the well-known bigger ones too, from Ifrit and Shiva right through to Bahamut himself), and your hero will defeat them for the most part through the use of those aforementioned skills. Each skill has a cool-down time, so you’ll be cycling through them, quite rapidly, and ideally you’ll want to take a combination of support effects to heal, or boost various statistics, as well as damaging abilities to hurt the opponent. 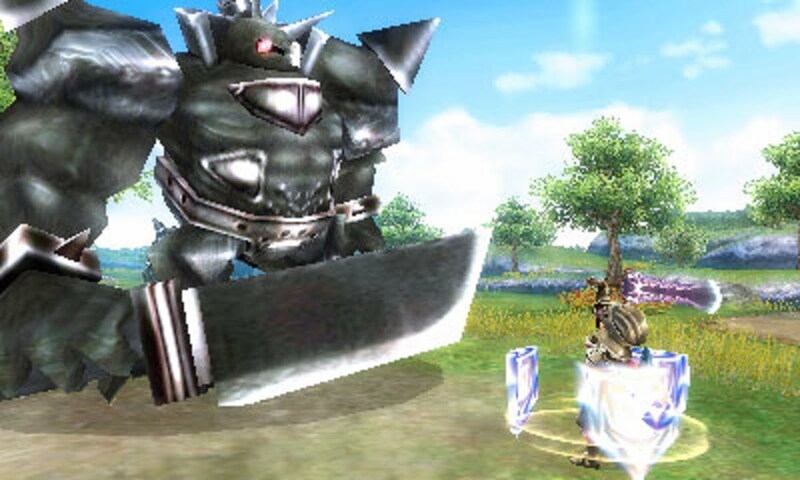 As characters battle more enemies, they start to access the ability to enact “surges.” These have two effects; firstly they give the character a boost to their strength to help in the immediate term, but they also have the ability to affect skills. At times, if you use a skill while surged, it will pick up new effects. After the battle, back in town, it’s possible to replace the "vanilla" version of that skill with the enhanced one, resulting in a permanent upgrade to the ability. This is a key way in which characters become more powerful through the grind; beyond the improvements they can make to equipment, the ability to highly customise and enhance skills is a system that has an awful lot of depth, and it’s possible to play for hours simply trying to tweak the skillsets to suit your personal strategy. Coupled with the equipment customisations and so on, and it’s almost overwhelming how much stuff there is to manage in Final Fantasy Explorers. It’s not particularly accessible as a result; though the early missions do a good job of walking players through the basic mechanics, it doesn’t take long for the development of skills and abilities to mandate an almost fetishistic attention to detail and a borderline-OCD compulsion to grind away for rare materials and the cash to acquire the best skills and equipment. None of that will be unfamiliar for people who have already played their fair share of Monster Hunter-type games, but it bears mentioning that this is a title that requires real commitment to get a sense of reward out of. I also question Square Enix’s use of the Final Fantasy name in association with this title. 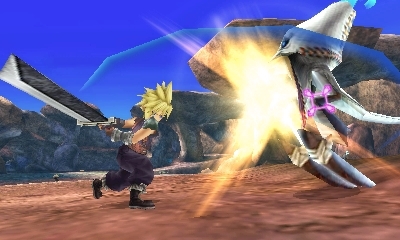 Final Fantasy has always been associated with epic narratives, to the point where even spin offs like Chocobo Mystery Dungeon somehow managed to build a rich narrative into the context of a roguelike. But Final Fantasy Explorers doesn’t have much of a narrative at all. On the field the focus is entirely on battling. At home, there’s a small village with generally uninteresting characters to speak to between missions. And while the environments have a kind of low-resolution beauty to them, they don’t tell much of a story in themselves. They’re very safe reconstructions of existing Japanese Monster Hunter or JRPG game tropes; the forest has a cool, wet atmosphere, the volcano is an angry red, and the beachside environment is bright and airy, but it’s nothing that we haven’t seen before. On top of that these environments are little more than glorified corridors or open arenas, anyway, with a sole purpose of either funnelling you through to the next arena, or throwing monsters at you. Room for exploration is minimal beyond belief, which means that there’s no real interaction with the space itself. Aside from occasionally pausing to pick up a resource positioned in plain sight, these environments are purely functional in design. The presence of classical Final Fantasy monsters is a nice touch, as is the instantly-recognisable victory fanfare after each successful hunt. The first time I got to fight a cactuar I had a real nostalgic thrill run down my spine. There’s plenty of Final Fantasy heritage and nostalgia built in there in there, and that almost makes up for the lack of an explicit narrative. However, to harp on the point for just a little longer, I did want more. Toukiden and Soul Sacrifice both made superb use of minimalist stories to build complex, nuanced narratives, and given the Final Fantasy series produces some of the most intelligent plots in all major blockbuster games (even the ones that are reviled - Lightning Returns’ narrative was unbelievably potent), it’s difficult not to be disappointed with the lack of any narrative meat here. A big part of the Monster Hunter experience is, of course, the social side of the game, and Final Fantasy Explorers does this remarkably well. Bringing together a couple of friends to go on a grand quest to take on iconic Final Fantasy beasts is genuinely exciting. Getting a bunch of Final Fantasy faithful together is even better; they’ll appreciate the heritage sitting behind what they’re doing. Because the job system is so varied, and the skills system so nuanced, it’s possible for teams to gel together very strategically, to the point where you could have one or two players built purely around supporting a couple of frontliners if you do wished. At those times Final Fantasy Explorers will almost remind you of the early era Final Fantasy titles, only now, instead of taking ownership of an entire team of heroes yourself, you’re just one of a team, albeit as a group you’re doing much the same loot grinding loop as you did back then. It’s also better to form parties when you can because when you play this game solo, you’re stick with monsters that you’re defeated and then resurrected (by collecting their souls and bringing them back to a special shop in the home village). At first it’s really quite exciting having a small army of classic Final Fantasy creatures at your beck and call, and there’s enough differences between them to make collecting ‘em all a fun process, but the AI of these creatures is terrible. In tougher boss fights they are temporary cannon fodder and nothing more. We are seeing Final Fantasy rely more and more heavily on a sense of nostalgia as the years go on. Titles such as Theatrhythm and Final Fantasy Type-0 are so effective in part because they heavily rely on the memories of the franchise that so many of us grew up with. For veterans, it’s a joyous thing to behold each and every time, with the warm familiarity of the enemies, the job names, and the music all washing over us in waves of nostalgia. It’s often enough in itself to keep us glued to the game for weeks or months afterwards. But for newcomers I can imagine that this would be, if anything, a barrier to entry. Monster Hunter is immediately beautiful, Toukiden has a firm narrative and Japanese cultural heritage to tap into. Final Fantasy Explorers feels like a game built exclusively for Final Fantasy fans, and then those Final Fantasy fans who don’t mind the series experimenting in genres outside of the classical JRPG. This isn’t a negative - if anything I appreciate that the developer managed to do something simultaneously different and authentic - but I can imagine how someone who hasn’t had much experience with Final Fantasy might feel some culture shock. Related reading: On the home consoles, the Monster Hunter clone you want is Toukiden: Kiwami. Matt's full review. So there are issues in Final Fantasy Explorers, but the qualities that it does have that meant I couldn't put it down overrode all of those. For all those rough edges I now had a “Monster Hunter clone” that offered a more cerebral approach to combat than its peers, and that’s something I appreciated a great deal. With the superb Final Fantasy heritage to support it and even compensate for the lack of narrative context, as well as some truly exciting multiplayer questing, this is a game I have a lot of time for, and will do so for a long time to come.